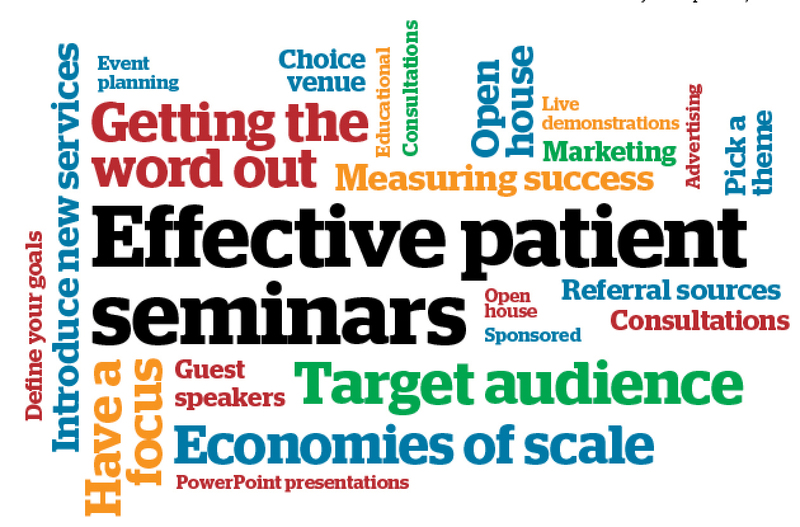 Patient seminars have become an integral component of a successful marketing communication strategy, effectively connecting physicians with aesthetic patients. They can be an affordable way to introduce new procedures to your existing patients, as well as to attract new patients to the clinic. In addition, seminars offer an opportunity to expand the reach of the clinic and to further define its product and service offerings. An open house helps to bridge the gap when patients are not ready to commit to a one-on-one consultation, yet desire some direct contact with the clinic to develop the comfort level needed to proceed with making a purchasing decision. They provide a learning opportunity, to meet the doctors, nurses, and the staff, as well as have their aesthetic goals validated. Surgery departments at institutions have long been on board with the concept of patient seminars. As an example, Cedars Sinai Hospital in Los Angeles, CA, holds regular ‘Introduction to weight loss surgery’ seminars that cover weight loss surgery options, including a discussion on the risks, benefits, complications, and the process from consultation to surgery. The presentation is given by one of the physicians and the clinical programme coordinator. This serves as a screening process for new patients considering bariatric surgery. The next step is a private consultation with one of the surgeons, but only after the patient has attended a seminar so they are well versed in what to expect. A successful seminar requires a well-executed marketing effort beginning 6 to 8 weeks in advance. Events can be held on a bimonthly or quarterly basis for optimal effect. Some clinics hold frequent in-office seminars throughout the year, and one annual or semi-annual large-scale event at an off-site location, such as a salon, spa, or private club. There are benefits to planning a series of seminars simultaneously, which allows for economies of scale in terms of advertising and marketing expenses. Featuring a calendar of events on your website and Facebook page offers additional ways to keep patients informed about upcoming seminars. ‘To keep patients engaged, it is important to keep seminars dynamic. We usually begin with a brief introduction and presentation of the technology. Showing before and after photos is also an effective way to demonstrate efficacy of the treatment. At times, we will have patients who have been treated speak to prospective patients as well; this is probably the most powerful way for patients to gain confidence in a newer technology that they may be unfamiliar with. Private mini-consultations are also offered for those who are interested. If a patient is deemed to be a good candidate for the procedure, they have an opportunity to sign up for the treatment at a special ‘event only’ rate,’ says Greene. An event may centre on a specific category of treatments or products, or a timely grouping of offerings. Introducing a new technology or a unique combined procedure that can be branded for your clinic is a viable theme for an educational seminar. The topic should be somewhat narrow in scope in order to attract the appropriate guests. Depending on the time of year, events can be tied into a seasonal theme. Major holidays, summer vacation, back to school, and other busy social seasons are prime targets for seminar planning. ‘Many of our patient seminars tend to focus on one specific treatment or new technology and are sponsored by the vendor. It is helpful to involve a representative to help with refreshments, answering questions, and overall support of the new technology. Many start-up companies and even established laser companies have shown significant interest in sponsoring these seminars to help promote their technologies. In this way, there is a definite synergy between industry and practitioner. These relationships are valuable to me, and have served as a great way to expand my practice,’ says Greene. Depending on the size and layout of your clinic or facility, an event may be held in the reception area or a larger conference room. It may include a tour of the facility. Another popular venue is to use the atrium of a medical office building and partner with your business neighbours to cross-market your services. Hosting an open house several times during the year for VIP patients, media and/or referral sources can buy a lot of good will in the community. Hosting an open house several times during the year for VIP patients, media and/or referral sources can buy a lot of good will in the community. Consider partnering with a charity that you are passionate about, or another nonprofit organisation and allocate a percentage of the proceeds from the event to go to support the charity. Larger-scale charitable events may also include a silent auction of items donated by vendors, patients, and friends of the clinic. If you can align your clinic with another non-competitive clinic, retailer, or other business, you can share the costs of the event and there is also a chance to cross-market to their customer databases. It is worth investing in a projector and screen. In lieu of a screen, you may be able to project your images on a wall or use a tablet screen. Adequate seating is important for guests to be comfortable. Purchase inexpensive folding chairs for additional seating. It is customary to serve some form of light refreshments including something to nibble on that is not messy and hot and cold beverages, depending on the season and time of day. In general, serving alcoholic beverages is only recommended in the evening. Avoid using paper cups and plates, which looks like a potluck supper. Rent or buy glassware and have cocktail napkins on hand. Fresh flowers add a festive touch. PowerPoint or Keynote presentations are central to a successful event. The presentation should be educational and designed to explain procedures and address the most commonly asked questions. You should also add your own clinical photography to personalise the presentation. Include key-staff members on the programme, such as nurses and estheticians, to introduce themselves. Each speaker may address a specific topic. Special guests add an interesting hook, such as book author, media personality, stylist, nutritionist, or trainer. Having an actual patient speak or attend the event, and doing demonstrations also add another level of engagement for guests. The programme should not run longer than an hour at maximum, including time for questions. Start with a brief introduction, and follow with a short presentation with visuals. If there is more than one speaker, 10–15 minutes per speaker is adequate. Always leave time for mingling and shopping at the end. Define your goals and objectives to decide whom to invite to your seminar. The target audience may include all aesthetic patients or a select group of patients. The best days of the week are Tuesday, Wednesday, and Thursday. Friday and Monday are more difficult days to attract patients, and usually weekends do not work because attendees have family commitments. The best day and time will depend on your target audience. For example, if many of your aesthetic patients are working women or women with children, evening hours may be best. Lunch hour or teatime may also be appropriate in certain markets. If you are trying to attract stay-at-home moms or seniors, morning hours may work. Always encourage patients to bring their partners to seminars, and welcome them to invite a friend. This offers an opportunity to introduce your clinic to a new group of potential clients. Place an invitation in an attractive frame in patient areas. Offer a sign-up sheet at reception, and email invitations to current patients. The invitation should include ‘seating is limited’ and a specified date for RSVPs, plus ‘bring a friend.’ The website Paperlesspost.com offers beautifully designed email formats that can be customised at a reasonable fee and look elegant. Everyone loves a goody bag to take home. The bag should have your clinic branding and may include brochures, skin care samples, mirrors, pens, or other giveaways from vendors. It is important to keep seminars educational and social in tone, avoiding an aggressive sales pitch or guests may not come back next time. 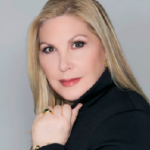 Consider adding imaging and diagnostics, such as skin analysis with a Canfield Visia® system at the end of the presentation or makeup artist to offer complimentary brow shaping or makeup applications. She uses a short slide presentation with as many before and after photographs that she can fit into a 10 minute talk with time for questions. ‘Any longer than that, and you will start to lose them,’ she says. Luring male patients to events is more challenging, even if you select a male oriented theme. Turowski’s practice uses their extensive patient database and social media to promote their events. ‘We do these events mostly in the evening starting at about 6 pm and they go until about 8 or 9 pm. If we have some patients who might have treatments that evening, we do not serve alcohol. For men only events, we may serve beer and wine,’ he said. Interestingly, most of their female patients do not bring their husbands or partners. Turowski is fortunate to have a lot of space so that they can accommodate up to 50 people with folding chairs. ‘We like to invite people to come to our office instead of another location, so they become familiar with us and what we offer. I typically give a PowerPoint presentation and open it up to questions, and we sometimes do a demonstration of a treatment on a volunteer,’ he added. Patients can sign up for treatments on the day of the event at a discounted rate, and they can come back to have treatments at their convenience. In addition to inviting your own patients, consider other potential sources in your local community. Consider asking referring physicians, salons or spas, or retailers in your area if you can provide seminar invitations for their customers. Invite potential referral sources to your seminar so they have a chance to meet the physician and the staff and to experience your facility. Investigate local online outlets that post event calendars, such as evenbrite.com and evite.com. Advertising in a local paper may help attract new patients. If you are planning a large-scale, off-site event, consider advertising in regional glossy magazines and promoting your event through local press releases and media outreach. At Anushka, they take RSVPs, as space is limited. ‘We normally do an email invite, along with distributing postcards for a few weeks before to clients who come in. We always encourage ladies to bring a friend, and a great many of them do. The hardest part is creating the excitement prior to the event that drives attendance. It takes talented, knowledgeable staff to convince these women that they cannot miss this event. Establishing a feeling of anticipation prior to the date is key,’ says Marting. As with all of your clinic-enhancement efforts, consistency is key. If you hold your first seminar and attendance falls short of your expectations, consider how you can do things better next time rather than giving up entirely. Success can be measured in several ways, and not surprisingly, quality over quantity rules. ‘A successful event is one in which a large percentage of attendees sign up for treatments. Our hope is that patients are so interested and enthusiastic about the treatment that they want to sign up immediately. However, I do not want patients to feel pressured to sign up on that day, unless they are confident that the treatment is right for them,’ says Greene. 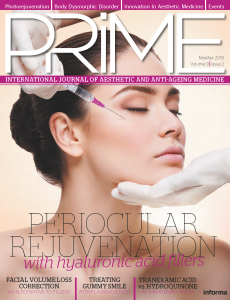 ‘As we are an Ophthalmology practice primarily, the aesthetics piece is something relatively new that we can offer to our patients. We were very pleased with how the event ran, and for a minimal cost, some good planning and pre-event promotion, we achieved a 50% booking rate for Pellevé in appointments made that night. The return on our investment was substantial, with $15,000 worth of revenue collected,’ she said.